With the cooler temps outside right now, nothing feels much better than a nice, warm hot tub! Folks ask us – how can I both enjoy my spa and feel happy with my bill once it comes time to pay to heat and maintain my spa? Below are a few great tips for energy conservation for your spa and hot tub – saving both energy and money while enjoying your hot tub. We all know that heat rises. 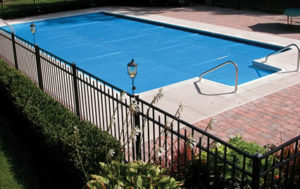 A spa cover that is in good shape will help keep in heat and conserve energy costs. A water logged cover will waste your heating dollars. If your spa insulated shell has seen better days, invest in a new one. The investment will pay for itself in the long run. Also, make sure the tie straps are latched when the spa is not in use as that will reduce heat leakage. Creating a windbreak around your spa with shrubs, a privacy panel or fencing, is not just an attractive privacy solution but can significantly reduce heat loss. A lot of spas have their factory temperature limit set to 104º F. By setting your temperature at 102ºF or lower, you can reduce your energy consumption significantly as it takes disproportionately more energy to heat each additional degree. And hey – what’s 2 degrees, right?! Turn down the thermostat when you will not be using your hot tub for a week or more. Keep in mind that unless your spa is winterized properly, during freezing weather, some heating must be maintained to prevent damage to the pipes and plumbing from freezing. 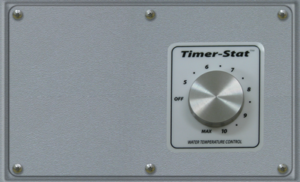 If your spa has a timer circuit, consider programming the thermostat to heat during ‘off peak hours’. If you have a well-insulated hot tub with a good cover, it will maintain its heat for hours after the heater is turned off. Check with your power company for hours and details. Air induction jets are a great feature in spas, which provide soothing massage while in your hot tub. 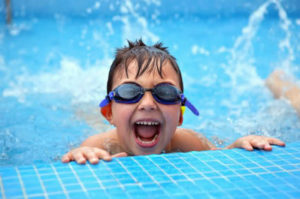 But with air being introduced into the water, it also lowers the water temp. The spa heater will have to work harder to heat the water. Consider using the jets a little less often. Also remember to shut-off air and water lights when the spa is not in use. Dirty or worn out filters will reduce the water circulation in your hot tub. This causes straining in the motor and your heater will perform less efficiently. Clean your filters every 3-4 months or as recommended by the manufacturer. The result of good filtration will be both energy savings and cleaner water to enjoy. A small investment for high return – a floating thermal blanket limits heat loss by insulating the spa and reducing evaporation. It also helps keep moisture buildup on your spa cover to a minimum, increasing the life of your cover. Sorry to be a downer but keep splashing to a minimum. Avoid wasting water as it has to be replaced and reheated. If leaks are evident, repair them. And if you have jets in your spa, adjust them so hot water is not being shot out of the hot tub. What ways do you conserve energy with your spa? Let us know in the comments.